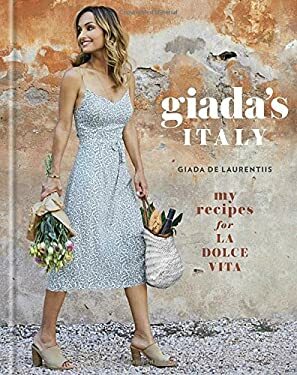 With photos shot on location around her native Rome, Giada's latest book--a New York Times bestseller--is a lavish exploration of her food roots and the lifestyle traditions that define la bella vita , with the contemporary California twist that has made her America's most beloved Italian chef. America knows and loves Giada De Laurentiis for her lighter, healthier takes on classic Italian fare. In her newest cookbook, she invites fans and home cooks to get to know the flavors and stories that have inspired her life's work. Here, she shares recipes for authentic Italian dishes as her family has prepared them for years while infusing them with her signature fresh flavors to make them her own, like in her Grilled Swordfish with Candied Lemon Salad; Spaghetti with Chianti and Fava Beans; Asparagus with Grilled Melon Salad; Bruschetta with Burrata and Kale Salsa Verde; and Fennel Upside Down Cake. Filled with gorgeous photography of Italy, peppered with family stories, and complete with more of Giada's tips and advice for cooking up fabulous meals with ease, Giada's Italy is a stunning celebration of Italy's flavors as only Giada could present them. New (95 available) BRAND NEW. Over 1.5 million happy customers. 100% money-back guarantee. Make your purchase count: support Better World Books' worldwide literacy partners.